"Being from deep South Texas, I learned many ways to prepare Mexican and Tex-Mex foods. This is my all time favorite!" In a medium saucepan combine tomato sauce, crushed tomatoes, chili powder, oregano, paprika, cumin, pepper, salt and garlic. Cover and cook over medium heat. Meanwhile, melt butter in a small skillet over medium heat. Saute onion for about 4 minutes; stir into sauce. Cook sauce for 20 minutes, stirring occasionally. Stir in bell pepper and cook 10 more minutes. See how to make a speedy enchilada sauce with authentic flavor. This was much better than the stuff that comes in a can. If you have the time, I would definitely recommend that the next time you make enchiladas you use this sauce. Deeeelish! I added a few fresh poblanos and jalapenos that I happened to have on hand. Pureed the heck out of the sauce for a smoother texture, and viola! Great flavor.Elaine in CA. Great stuff. I added a pinch of cinnamon, it was perfect. 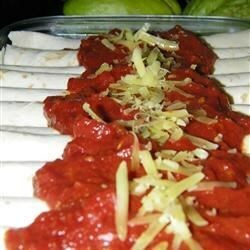 Easy and yummy enchilada sauce! I thought it had just the right amount of spice and flavor. The only thing I changed was I substituted olive oil for butter.